New to live, low-stakes cash games? Here's a starting guide with five tips to help you as you begin. 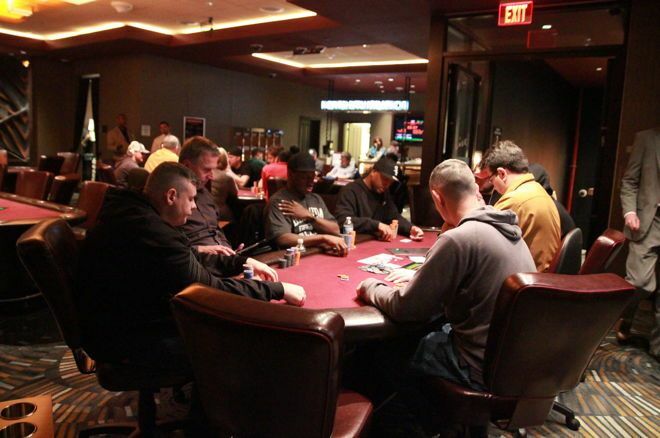 Five tips for new poker players looking to get started playing live, low-stakes cash games. You're relatively new to casino poker. You're not used to public poker rooms. Everyone seems to know what their doing — except you. They act so quickly, while you still need to think about what you're going to do. You wish you had someone to guide you, as you make your way in this new world. Good news! You do! Consider this your starting guide. Who cares if you look like a newbie? It doesn't matter. Let people think what they'll think. You focus on playing well. If your opponents are really skilled, they'll try and make you feel comfortable and relaxed. Anyone who doesn't do this is a fool himself. So don't worry about it. Instead, use your image to your advantage. Your first step is to clearly establish your image in the safest and simplest way possible. When you're starting out, play very few starting hands, and play them aggressively. Wait for A-A, K-K, Q-Q, A-K, in early and middle position, adding ace-suited and pairs in late position (the last three spots in the rotation). With the big pairs raise three times the blinds from any position. Call with A-K. Add in calls with pairs and suited aces from late position. Toss everything else. Keep it simple, and keep yourself out of trouble on the flop, turn, and river. Bet when you think you're ahead. Check and call if you're getting good pot odds to do so with your drawing hands. Yes, playing this way will mean aggressive players will be able to rob you. And yes, this isn't a long-term optimal strategy. So what? You'll make your money from loose bad players. And you'll spend a lot of time out of the hand watching how other people play. Learn to enjoy the observations, and learn what you can from watching others. It's what you'll be doing most of the time when you start out. Play in games with the loose bad players who will give you their money when you have a strong hand. How will you know if this is one of those games? Watch the game for at least five or so hands. You want lots of checking and calling, not a lot of raising and three-betting. If you don't find a game you like, don't play, just watch. Sooner or later you'll find a good game. And again, in the meantime, you'll get a chance to watch and learn. Remember to put watching and learning on your list of fun things to do in a poker room. The first step in using your image to your advantage is to recognize what it is. If you play as I've recommended — tightly and aggressively — you will appear tight and aggressive to a fault, but only to those who are paying attention. Observant players will assume that your actions mean what they appear to mean. When you bet, they will assume that you have at least something strong. If you raise or reraise, the observant opponents will presume you are loaded. If your good opponent doesn't fold on the flop, bet the turn no matter what it is (unless he bets, in which case you should fold). If you don't win the pot by then, check and fold if your opponent bets. But at least give it a shot. Your bets should be a little more than half-pot, enough to make them appear serious. Your image will do the rest (most of the time). Don't let the results go to your head or bother you. Be a smiling, friendly, listening opponent, someone who doesn't get bothered by anything. You are experimenting at this great game, trying things out, seeing how they work. If the combination of your tight play and your occasional aggression doesn't happen to work this time, no big deal. It wasn't for lack of a good plan. Be ready to end your session when you feel like you have lost or won enough for one session, or when you are tired of playing poker, and go home either a winner or a loser for the day. It shouldn't really matter too much to you. If it does — that is, if you can't stand the losses, or if you are counting too heavily on winning — then you need to rethink why you are playing this frequently frustrating game in the first place. As a new player, you want to learn how to win, of course, but you also want to learn how to make the game fun.